Part II: What form should I file? 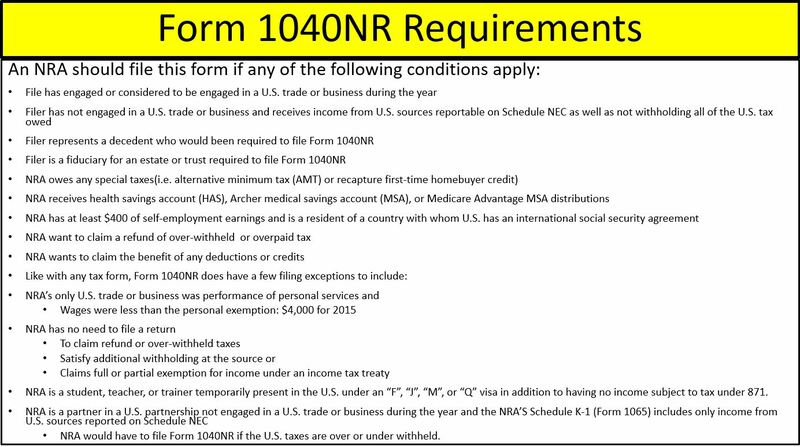 This three part series will look at who qualifies, requirements and exemptions based on individual circumstances, and, finally, special considerations to note when filing a 1040NR: U.S. Nonresident Alien Income Tax Return. After establishing who is considered a U.S. nonresident alien (NRA) in Part I, the next step is understanding what conditions require an NRA to file this form. 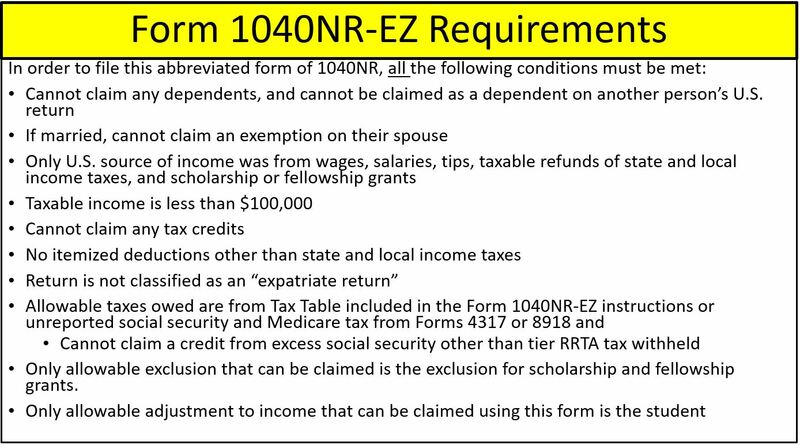 This segment covers the qualifying conditions and exceptions for using Form 1040NR and 1040NR-EZ as well as additional form requirements based on triggering circumstances. As mentioned in Part I, dual-status taxpayers may need to file both a 1040 and a 1040NR to separate the income while as both a U.S. resident and as an NRA during a given year. A resident alien on the last day of the tax year – taxpayer should file Form 1040 with a Form 1040NR statement. Form 8833 – Treaty-based Return Position – This is the most common form filed along with Form 1040NR. A taxpayer must file this form if the taxpayer determines residency under an income tax treaty and receives income or payments greater than $100,000. See Publication 901, U.S. Tax Treaties, for a complete list of tax treaties. Form 8840 – Closer Connection Exception Statement for Aliens – Statement filed if the individual can establish that they maintain more significant contacts with a foreign country than the U.S. Refer to Part I for more details. Form 8843 – Statement for Exempt Individuals and Individuals with a Medical Condition – This is not an income tax form. This forms allows you to explain why the days you were in the U.S. can be excluded for purposes of the substantial presence test due to either being an exempt individual or were unable to leave due to a medical condition or medical problem during your stay in the U.S. This does not include planned medical trips to the U.S. for scheduled procedures. Form 8938 – Statement of Specified Foreign Financial Assets – This not required for most NRAs. Dual-resident taxpayers may be required to file this form. This reporting applies to those nonresident aliens that have an interest in specific foreign financial assets that have aggregated values that exceed the reporting threshold. See form for more details. 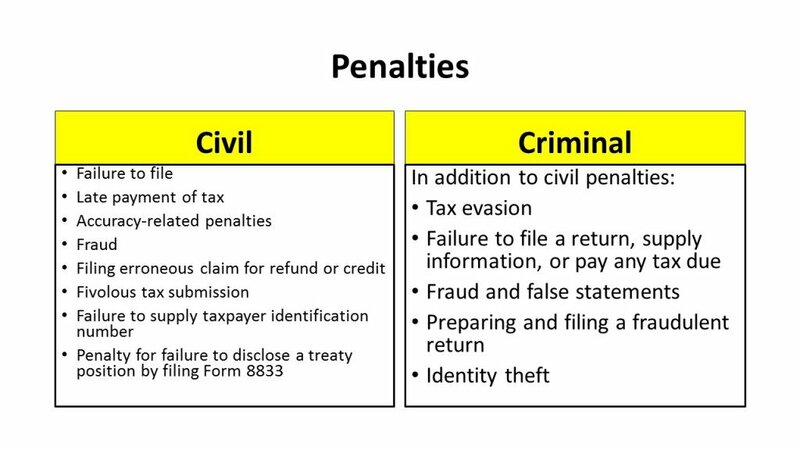 Form 8854 – Initial and Annual Expatriation Statement – This form must be filed as soon U.S. citizenship has been relinquished or long-term residency has been terminated; otherwise, you will still be taxed as a U.S. citizen or resident. This form can be filed attached to your income tax return (Form 1040 or 1040NR) for the year you expatriate. A separate copy is also required to be forwarded to IRS whether an income tax return is filed or not. See instructions for more details. As with all tax forms, there are penalties, both civil and criminal, for not filing. Your individual circumstances play a major role in which forms you may need to complete as a NRA. Having a better understand of why a certain form is used is helpful when completing Form 1040NR since special considerations may have long-term consequences. Next: Part III concentrates on the special considerations to keep in mind while filing Form 1040NR. Still not sure which forms you need to file as an NRA? We can help. Contact us today! Posted in Personal Tax and tagged Federal Tax, Form 1040NR, International Tax, IRS. ← Are You a U.S. Nonresident Alien (NRA)?